When I need one.... I can't always find a portable charger. I should keep them in one place so I know where to look but they inevitably end up scattered around the home and car, work, too sometimes. Here's your chance to win a nice sized one at 13,400 mAh of power. US residents have through 4/9 to enter. Good luck. Read Powered by Mom's Review HERE. The AdventureUltra is one of their largest battery banks and has the highest power output. Designed to replace the heavy and bulky generators used when tailgating or camping, the AdventureUltra is a streamlined power source that can run a 32-inch LED television for up to three hours. The AdventureUltra has a maximum power output of 45 watts, enough to run a fan or recharge a drone battery. It can also be used with 2 in 1 laptops and new laptops, such as the 12-inch MacBook, that require less than 45 watts either when powered off and solely charging or when powered on and charging simultaneously. 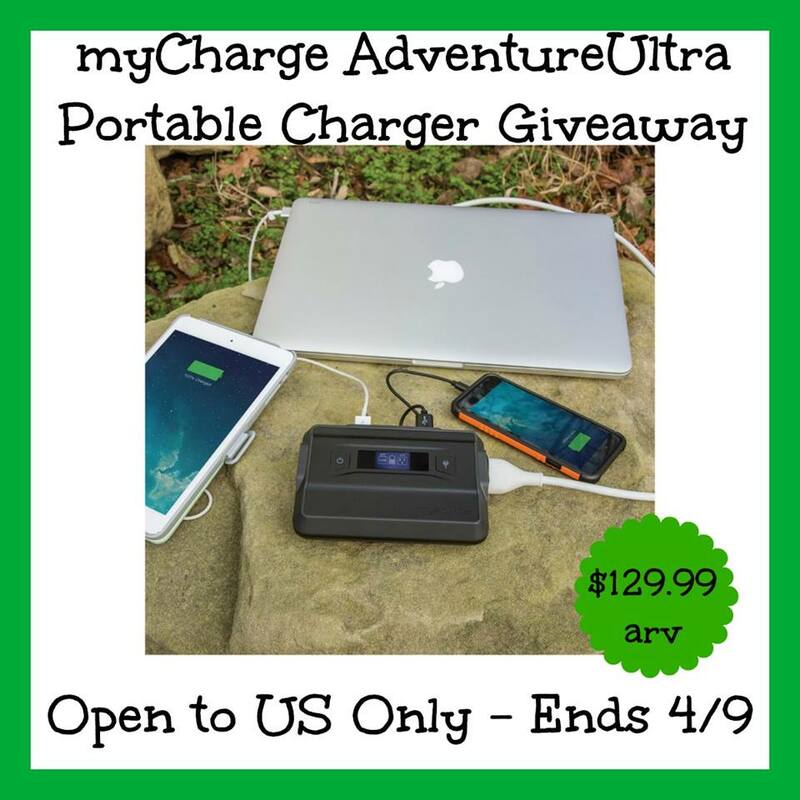 One lucky person will win the AdventureUltra a $129.99 value. Enter on the Giveaway Tools below and remember to come back for the daily entries. There are times when it is necessary to have a phone that is charged and there are times when light is necessary and the electricity is out. I'd like enough power to watch a movie on a projector while camping. I would like to win it because it would be great to have when I go camping. I can't wait until June to start camping. We love to travel. With three kids and too many devices, this would make long drives so much easier! It always seems like my phone dies just when I need it the most! This would be awesome! I'd love to win it for all of our devices. It would be really useful. I love the power behind the power bank. It’s super powerful and will definitely come in handy when we’re runnjng around this summer and I forget to charge our current power banks. I go to events with my daughters. My middle daughter sells her art and novels at anime conventions and author shows. We don't always have access to an outlet (or they charge you to use them) so having something like this to keep our phones charged when we are without another way to charge them through the day, would be a real godsend. I travel with electronics a lot and need a strong charger to last charging my phone, kids ipads, and other devices. I love how this is strong and can handle charging more than 1 item. I want to win because it's good when you're on the go with so many devices especially on vacation. I'd like to have one because my power goes out a lot. Besides emergencies it would also be great for convenience, traveling, and outdoors. I have a my charge charger and love it! Its awesome.